You’re tired of hearing about the never-ending Trump administration trade negotiations with China. And we’re tired of reporting on it! But the drama continues all the same, and the implications for markets are too important to ignore. President Trump changed his tune this week, suggesting the trade talks aren’t going as well as he has hinted at before. Trump said this week that tariffs he has already imposed on about $250 billion worth of Chinese imports will stay in place for a “substantial period of time,” as leverage against China should they cheat on whatever agreement they make. “We’re not talking about removing them,” Trump said. Bummer. Even more bummy, there are new reports that China has hardened its stance on some of the issues in dispute, perhaps because it sees Trump bending and its leverage is improving. We’re now well past the March 1 deadline Trump set for a deal, yet uncertainty persists and trade-war fatigue is setting in. 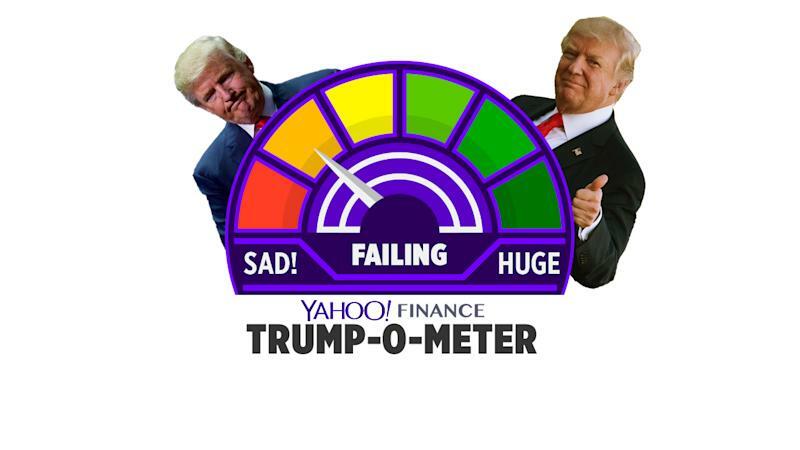 For these reasons, this week’s Trump-o-meter reads FAILING, the second-lowest mark. Markets care about two things in the U.S.-China negotiations. The most important thing is avoiding new tariffs on Chinese imports, which would be more stringent than the first round of levies and largely hit consumer goods. Markets seem to have priced in such an expectation, with the S&P 500 index up about 12% for the year. Trump probably knows markets would take a hit if talks with China broke down and he rolled out these new tariffs. Consumers would also notice higher prices on many popular items, which could hurt Trump’s already low approval rating. It would be a bonus if Trump rescinded the tariffs he imposed in stages in 2018. That part now seems unlikely to happen. It’s possible Trump will hold this move in his back pocket until later in 2020, to juice markets in the late stages of his reelection campaign. But that’s so far off it’s hard to know what effect it might have by then. There were other rumbles in Trumponomics this week. Trump said he plans to nominate Stephen Moore to the Federal Reserve Board , a controversial move that could flop in the Senate, which would have to confirm the appointment. Moore is a Trump loyalist who served as an economic adviser on the 2016 campaign, and his appointment reeks of politicizing the Fed, which prizes its independence. The Senate might say no. Trump also said he blames the Fed for suppressing economic growth in 2018, claiming it would have been closer to 4%, rather than 3.1%, if the Fed hadn’t been raising interest rates. In reality, the Fed began raising rates in 2015 and did so at a measured pace through the end of 2018, before signaling a pause. That’s what the Fed is supposed to do during an economic expansion, to keep inflation under control and guard against the formation of bubbles. Trump is a pre-emptive scapegoater who has an excuse for everything. If he really wants to goose growth, he could start by calling off his harmful and protectionist trade policy, which hurts farmers and needlessly raises costs on U.S. businesses and consumers . He’s not going to do that, so the best-case outcome may be for him to stop bashing the Fed and cut a deal with China. Any day now would be fine. How ‘bout tomorrow?